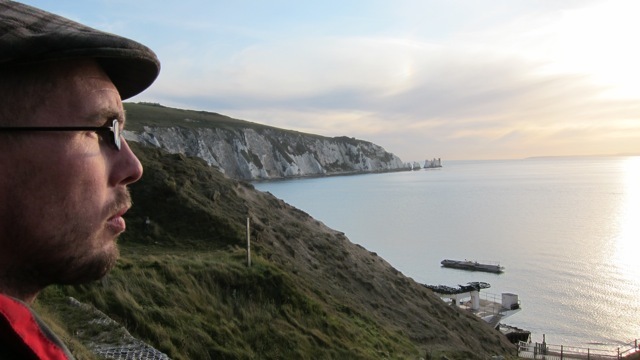 In case you are reading this as a stand alone project I must mention that this Project Report is intertwined with PR2 which was a design for leaving England. It incorporated most of the preparation work we had to do in regard to equipment we needed, health requirements and booking travel for the first stage of our journey. Our first major observation, and one that took place before we began this trip, was that we needed rest. The process of leaving home to move to another country was a testing one, both physically and mentally. Nina and I decided that we would beeline it to Morocco to rejuvenate. “It would be warm there, we can find somewhere to do our work, relax and plan our onward travel”. We were observing and interacting with our circumstances, that we were tired, a bit stressed and emotional. 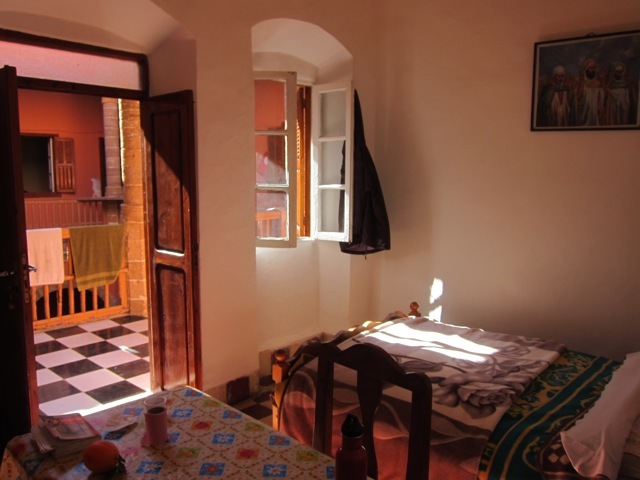 We found the ideal place to stay and work here in Essaouira. A nice room with a desk, wifi and hot showers, all for around £7 a night. For two people that’s pretty good hey. From here we will be designing a large part of our trip baring in mind that we don’t particularly want to plan every aspect of our journey at this stage, leaving room for our needs of spontaneity, change and opportunity. I must make clear that this design will take place over the course of our travels. That could be one year or more. We will be documenting the process and checking in with our goals and with each other regularly. In that period I will also be taking on land based design work as we move across the world. The next observation to understand is that this design is not a land based design. It’s a design for people, travel, culture, learning and life. It is about our lives over the next year or so and what it can teach us for the future. How do we want to live and interact with the world in which we pass through? It’s relatively simple to understand the boundaries, resources and opportunities presented within a land based design. Trying to use the same principles for a life/people/travel design is certainly an new experience as we also have to consider the needs of all people involved. 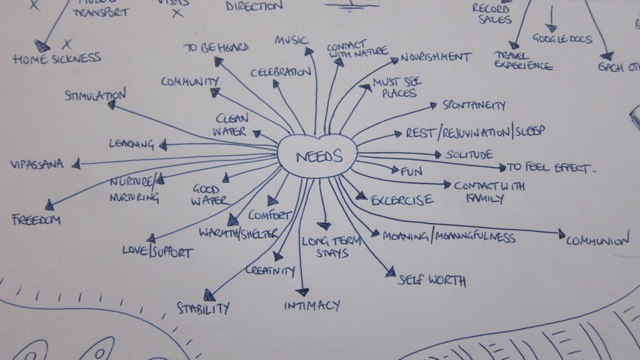 How will we make sure that our needs are being met? This is my diploma project but the journey we are on and our lives as we live them are as much about Nina’s needs as they are my own. The thought showers and mind maps of various stages of this design must be a co-creative process once again. 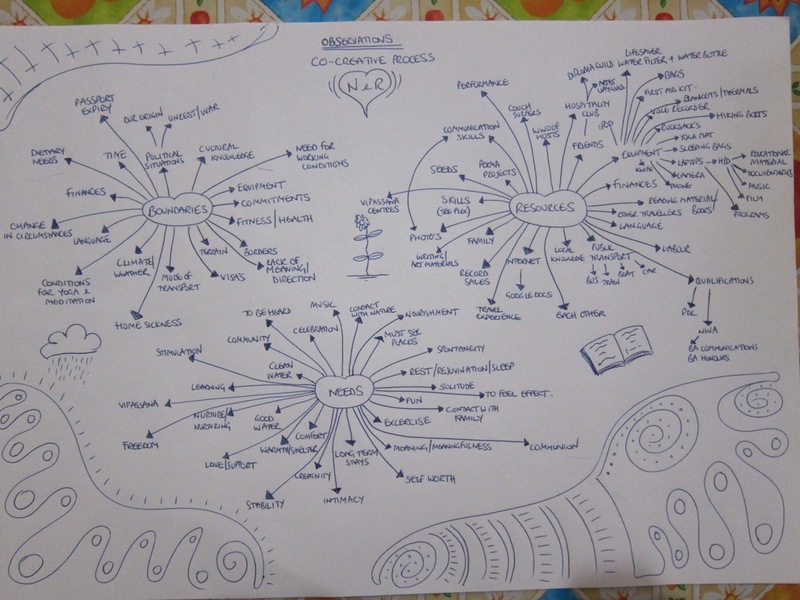 Here is a mind map that Nina and I worked on together to highlight some of our boundaries, resources and needs. Perhaps some boundaries or limitations that we have not highlighted are our own patterns or habits and the confidence that we do or do not possess. 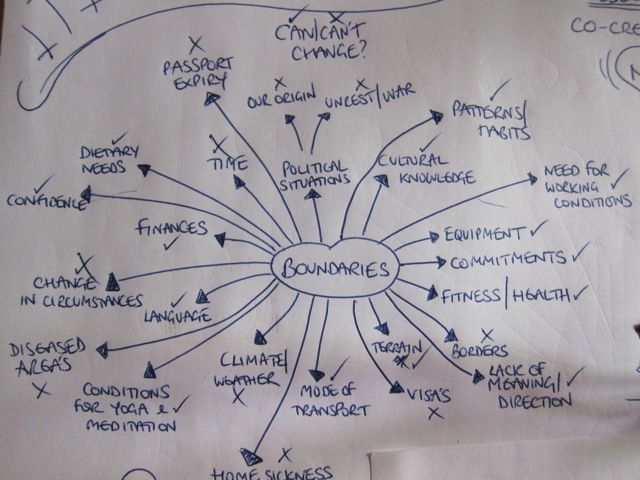 These are personal boundaries along with our origin, our need for working conditions, fitness and health, possible lack of meaning or direction, home sickness and dietary needs. It’s easy to understand the physical constraints such as transport, terrain, the equipment that we carry and borders we will have to cross. I’m not too sure how to describe the others at this stage. Another one to mention is disease, for example, areas of high malaria risk that we may want to avoid. Another way to look at these boundaries are by dividing them into things we can change and things that we cannot change. This will present opportunities for pushing edges and hopefully throw up solutions to problems. I will look at each one of these in the design process. 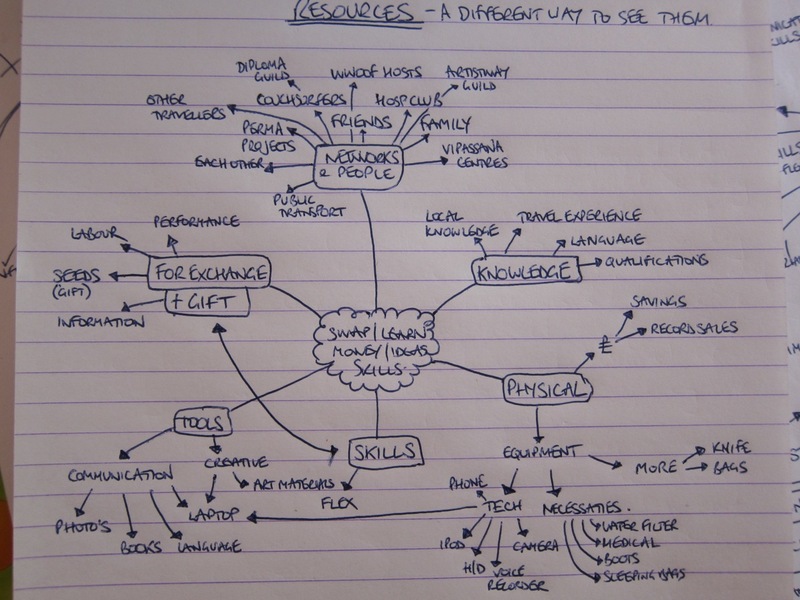 They are also all interconnectable, for example our physical resource of money can be used as an exchange to buy new tools for creativity. Another example, taking money out of the equation, is using existing skills as an exchange or even giving seeds that we are carrying from the patch in exchange for lessons or food. In this day and age the internet is a precious resource for travelling. Up to date information can be found on almost any country, border crossing or visa application service. We will be travelling with laptops as we plan to blog our way to Oz and so we will have access to information wherever we are able to access the internet…eek! We also have every lonely planet in digital form. This is helpful for an initial quick learning curve on a new destination. People will hopefully be a resource too. Wwoof hosts in exchange for work will house and feed us. This is something I am extremely excited about. We are members of the Couchsurfing website and the similar Hospitality Club website. We aim to visit Permaculture projects along the way which will be vital in networking and exchanging information. Other friends and fellow travellers are a great resource and often provide rest bite in conversation after weeks of grappling with unknown languages. We hope that our skills will be a resource and we would like to offer performance or creative skills as exchange for accommodation. Music festivals are a great example of this. Maybe most importantly, my desire to contribute to permaculture design can be used as an exchange or gift, this indirectly contributes towards cultural capital. We have a sleeping bag each. They have opposite left and right zips so that we can join them together. Nina researched the differences between natural fibres and synthetic filling to find that all but one company used cruel feather harvesting techniques. We considered purchasing a fully recycled filler but decided against this option as the bag in question didn’t fulfil our needs. A synthetic bag is more easily cleaned, cost effective, long wearing, lightweight with better thermal properties in damp conditions. We have a lifesaver water filter/bottle which enables us to drink pretty much any water from anywhere. We found that even bottled drinking water sold in many developing countries contain extreme amounts of pesticides. This will also save us a lot of money over the course of our journey. The biggest impact could be environmental. If we were to buy plastic water bottles each day over the course of a year it could add up into the hundreds. knives, sporks and plates for food preperation allowing us to self cater as much as possible. We have an amount of money that we have saved also which I don’t think is a good idea to divulge on a website. What is important is how we use it carefully. We realised that this design would not and could not be of use to us if we did not recognise and integrate our needs. When we started to look at them we realised that our needs are virtually the same and so we didn’t feel that it was appropriate to separate them. They seem like basic human needs to most people and maybe we are all guilty of taking them for granted given our privileged position in this world. This journey will push some unfamiliar edges and also bring us much joy. There will be the need for fun and excitement but also rest and comfort. This could come in the form of long term stays. The need to keep our health in good shape with good food and clean drinking water is vital. The need for exercise will not be too difficult to achieve given that we have big old rucksacks to carry. There is also the need for “must see places” and not forgetting opportunities to engage and learn new skills. We would like to integrate a way of checking in with each other to make sure that our needs are being met. There is also the opportunity here to consciously design them into our journey.